American exceptionalism in foreign policy is valid only if we believe that U.S. leaders, regardless of party or ideology, always act out of the best interests of the world. If you're a Republican: do you think President Obama (or Clinton, or Carter) meets that criterion? If you're a Democrat: do you think Dubya, Bush, Sr., or Reagan met that criterion? No, of course not. This alone should give the lie to the myth of American exceptionalism. The bulk of the evidence shows that the U.S. does what's best for itself, according to the judgment of current partisan administrations. Engelhardt spends some time talking about Putin and Russia. I know a little about both. We're oddly connected, America and Russia, although we may not realize or acknowledge it. I mean, if there are two countries on Earth with delusions of exceptionalism, they are the U.S. and Russia. That's the irony of Putin's recent denial of American exceptionalism. I have confirmed this in many conversations with Russians. They are always curiously eager to convince me of Russia's enduring greatness, its parity with America, what their country means to the world, and so on. Nobody I've ever met from any other country suggests much less seeks out a conversation like this. A few times Britons, wistful for empire, have told me, "It's your problem now, you deal with it." As if that's what we've volunteered for! The U.S. perspective is a bit different. Since 1992, we have taken our hyper-power status for granted. We basically stopped paying attention to Russia 20 years ago. So what I usually tell Russians, both to enlighten and provoke them, is that the average American doesn't think about Russia at all. Many ignorant Americans still think the USSR exists; and yet Russians don't figure in our worldview anymore. (For the mere fact of 8,500 nuclear weapons still in Russia's arsenal, Americans are quite mistaken in their disregard). What most Americans don't realize is that Russians, like Americans, take inordinate pride from their country's foreign policy, and perceived military prowess. Just as in America, where rednecks who can hardly spell their own names feel an out-sized sense of personal pride for being the citizen of a country that can bomb, drone or nuke anybody on Earth, so do Russians -- who are mostly poor, without basic liberties and cut off from the outside world -- augment their self-esteem with pride in being citizens of a nuclear-armed super power that can bully its near neighbors with impunity and occasionally stand up to the U.S. in the UN Security Council. So my rhetorical question is: are Americans just Russians with a different political economy? Or are we indeed different? Is America exceptionally exceptional? And if so, in what ways? Taking pride in our civilian-controlled (read: political) military can't be the reason why. 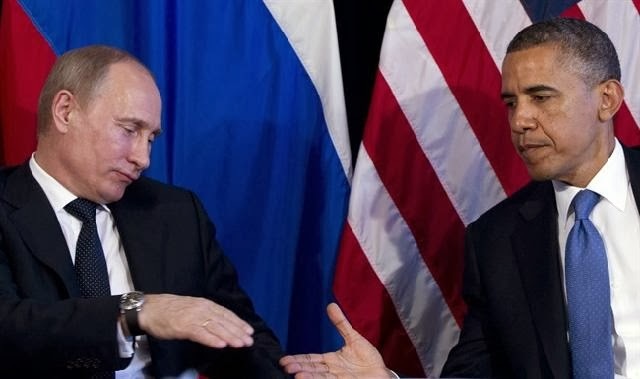 UPDATE (30.09.2013): FYI, here's a report on a recent Gallup poll of Americans' attitude toward Russia, "Poll: Half Of Americans See Russia As 'Unfriendly' Or Worse". Looks like Putin is successfully lowering Russia's rating in the U.S.
Labels: American Exceptionalism, nukes, Obama, political economy, Putin, Russia, Stalin, Tom Engelhardt, U.S.